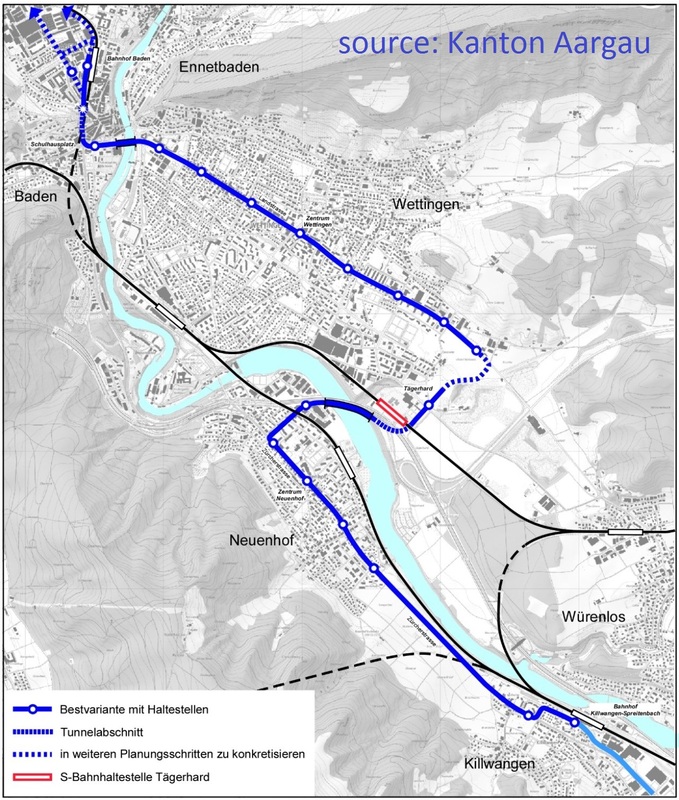 Plans for the extension of Limmattalbahn to Baden are making progress. The line will continue beyond its (soon to be constructed) Killwangen terminus and run to Neuenhof, before crossing the river Limmat where it wil form an interchange with a yet to be built station on the S6 line by the Tägerhard shopping centre and then running through the centre of Wettingen and on to Baden station, again crossing the river (probably on the existing bridge). A pre-project is presently in hand and hopfeully a decison can be made in 2020. Interestingly, this map also indicates the longer term option of extending the line beyond Baden station. Another point of interest is that the final approach to Baden station is from Schulhausplatz and through Schlossbergtunnel. This was originally a railway tunnel, which was vacated when the railway was realigned in 1961 and then widened (considerably) into a road tunnel (part of the road onward from there towards Neuenhof is also on the old railway alignment). In a project realized from 2015 to 2018, a single-lane bus tunnel was opened on a lower level of the tunnel. It is not clear whether this wil also serve Limmattalbahn, or whether the tram will run on the upper level with road traffic.